“Heavy, ominous psychedelic free-improv from Tokyo, Japan. 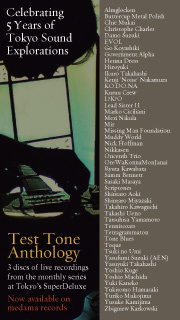 Tetragrammaton is a trio featuring Nobunaga Ken on drums and percussion, Cal Lyall on electronics and guitar, and TOMO on hurdy-gurdy, saxophone and electronics, and have in the past collaborated with members of Zeni Geva, Acid Mothers Temple, Taj Mahal Travellers, and Damo Suzuki from Can. 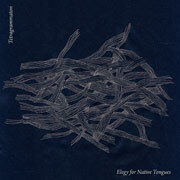 On Elegy For Native Tongues, however, it’s just the main trio at work, displaying a love for high-volume improvised noise and far-out psychedelic jazz meanderings that is spread across two discs in this debut release. The first disc features five tracks recorded in the studio, all lengthy freeform explorations that mix up druggy, laid back free jazz and blasting skronk with endlessly droning electronics and heavy clouded feedback, Hawkind-style space rock fx and pounding drums, shapeless distorted guitars and scrabbly hard rock riffs, shamanic howling, hurdy-gurdy, and other sounds that all build into dense tangles of otherworldly drone and heavy free-jazz clatter. On tracks like “The Ghosts Won’t Starve But We Will Perish”, the drumming sticks with more traditional jazz rhythms that are augmeneted by weird skittery percussive sounds, and the horns streak dark shadows across a subtle dronescape before the sax begins to wail out twisted Middle Eastern flavored melodies. In contrast, the title track blends together energetic improv drumming and meandering guitar with blasts of Brotzmann-esque sax wipeout and scathing electronic noise. Tetragrammaton create some truly massive drones throughout their jams, but the sax always seems to take the lead, making this sound like Sunroof or Hototogisu gone free jazz, thick waves of feedback and rumbling ambience swirling around the room in ever-increasing volume and mass while the sax bleats and screams and murmurs through the mix. The second disc is a live set recorded in Tokyo in 2007, and the three tracks that are included here are just as loud and dense as the studio stuff, if not louder. The second track in particular is a real crusher – “Solve et Coagula” slowly builds into earth-shaking Skullflower-like dronerock, mutant acid guitar lashing against a massive churning metallic drone, the free-jazz drumming all but obliterated by the maelstrom of electronics and feedback.